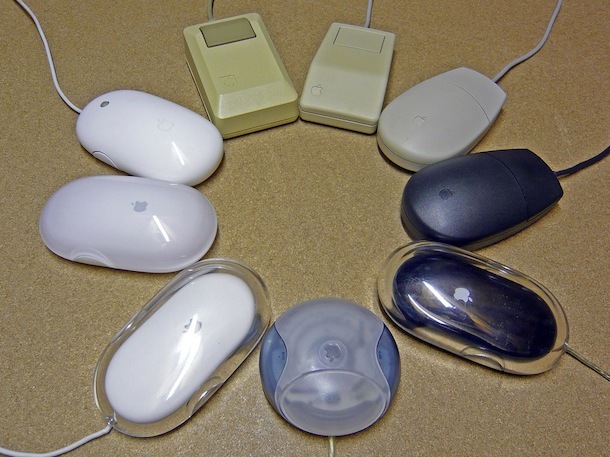 I just came across this picture on Flickr and I think it’s a cool tribute to all the years of the Apple mouse. It’s missing the latest creations like the Magic Trackpad and the Magic Mouse but it still shows the evolution of hardware pretty well. Great picture! I’ve said it before, and I’ll say it again. Steve Jobs hates mice. For a system based on GUI, Apple has always had crappy mice. The hockey puck was the absolute worst design in the history of personal computing. The lucite was cool looking, but if you had to do a lot of precise movement, the weight produced carpal agony. Actually, I think Apple has made the best mice in the world from a technical standpoint – they’re always the most accurate tracking, etc. But from a usability standpoint, yeah, they’ve always sucked. The Magic Mouse is friggin horrible, second only to the hockey puck mouse, IMO. If the square original mice were two button they would be great. The hockey puck was a terrible mouse, no idea why Apple released that one. Magic Mouse is a good concept but it’s too sensitive to touch, I constantly was activating things I didn’t want. I ended up just going back to a two button logitech with a simple scrollwheel. As Apple well knows, sometimes simple is better.